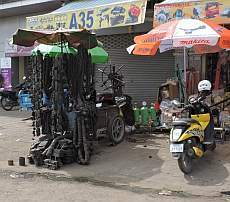 Topics: Sidewalks as Showrooms – Welcome to Cambodia, and…..
Sidewalks in Cambodia are basically used for anything and everything except walking. Click here to see the sidewalk as showroom. Next Next post: Plan to Vote!